Terra Mater Extra Virgin Olive Oil from Chile is produced from the seasons first olives. The olives in Terra Mater Olive Oil are harvested in April & the olive oil is released in May. Terra Mater olive oil is lightly filtered & bottled within twelve hours of decanting. 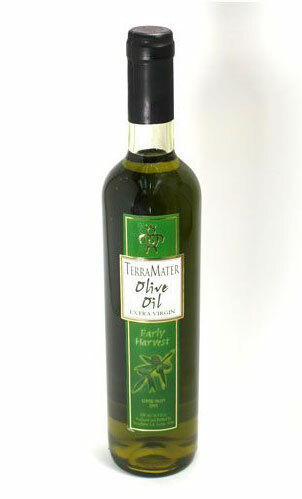 Terra Mater olive oil is complex & is well balanced with spicy, grassy, earthy-green color characteristics. Terra Mater Chilean olive oil has herbal flavors with a taste of artichoke, celery, green tomato & pepper, with nut & almond notes. A versatile olive oil Terra mater means Mother Earth & is new-world oil produced with old-world technique & care! Terra Mater Extra Virgin Olive Oil.